Creative Assembly are rapidly becoming the model for post-release support. Rome II’s iffy launch version, in which the gears were all too often visible through the cracks in its elaborate conflict fantasy, recedes in the memory. Comprehensive weekly patches are already seeing to that – as well as gestures like this one. 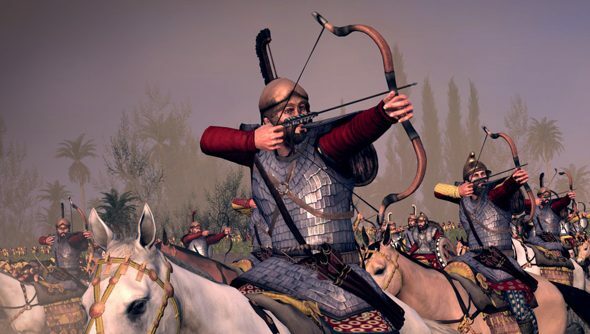 The developers promised both free and paid-for DLC in the months before Christmas, and listed the sizeable Nomadic Tribes Culture Pack among the stuff to shell out for – but have since decreed it’ll be free on Steam for the next week after all. The Nomadic tribes are defined by their way with horses and knack for pulling together unnervingly large armies at a moment’s notice. They bring an “entirely new cultural flavour” to Rome II, and it comes in three variations. The Royal Scythians represent the social elite, and couple a magpie want for conspicuous wealth with unmatched ranged prowess. Their royal horse archers are the centrepiece of their forces, and are joined by Royal Skirmishers – javelin-equipped riders. They’re not nearly so exciting as the armour-focused Massagetae, though – a confederation of tribes whose horseback cataphracts use their weight to crushing effect. Those units are complemented by Saka Noble Armoured Lancers, who excel in a charge. The Massagetae’s most notable achievement was in the killing of Cyrus the Great – founder of the Achaemenid Empire and man foolish enough to lead a Persian army into the steppes. The melee-driven Roxolani, finally, are a tribe in a position to take advantage of circumstance when the game begins. The Scythians are weakening, and this lot are primed to take their place with the help of three specialised cavalry units – the heavy Royal Lancers, plus the spear-wielding Sarmatian Riders and Horsemen. On the campaign map, the Nomadic tribes make use of tents and yurts rather than brick or stone structures – a potential weakness. However, their building chains offer bonuses in the production of shepherds, horsemen and archers. The Nomads are the second new playable group to be added to the game in the space of a week, following the similarly cavalry-dependant Seleucid Empire on Friday.Do you think you’ll start anew to try one of them?With all these nags about, I’m reminded that the only real way to play the original Shogun: Total War was to trample your routing enemies as the Mongols.